This GPX Dual Alarm AM/FM Led Clock is in great working condition. 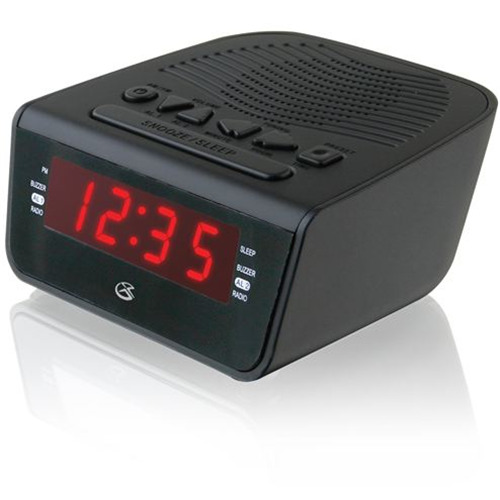 GPX C224-R Dual Alarm AM/FM Led Clock: This clock radio has a dual alarm function to make sure you get up on time. Dual alarms are perfect for couples or weekend alarms. The wake function lets you wake up using the radio or alarm and even has a large snooze button. Listen to music, news, weather and traffic with the AM/FM radio. Program your favorite stations to memory for quick and easy recall. There are 10 am and 10 FM presets and a digital volume control, so you can set this clock radio to a comfortable level for your own personal use. The modern styling looks great anywhere. The intuitive controls allow for easy operation and a 0.6 Inch red led display is easy to read. The clock can run off ac power (adapter included), but for peace of mind, it also runs on battery backup from 2 AAA batteries (not included). For more than 30 years, GPX has offered one of the broadest portfolios of technology-driven consumer audio and video products. An award-winning consumer electronics company, GPX has built a solid reputation on excellent product quality, reliability, design and affordability.